Welcome to Makers' Monday, a celebration of knitting designers, artists & creatives. Being part Irish, I'm still looking forward to St. Patrick's Day so I'm keeping the theme going. Today we'll be taking a look at a few St. Patrick-y project bags and stitch markers. 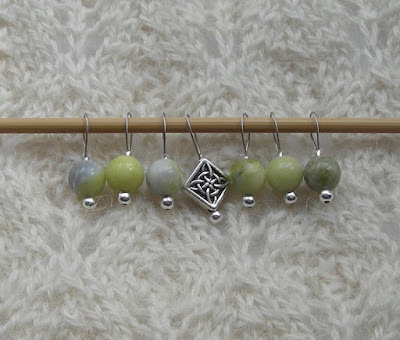 First, let's check out a few stitch markers. If you aren't an Outlander fan, (gasp!) maybe you'd prefer these removable markers also from Lavender Hill Knits. It's sort of hard to see but they have tiny little flowers on them. 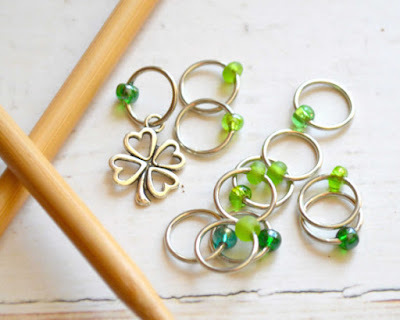 Or how about these adorable shamrock stitch markers from Blue Dog Workshop. 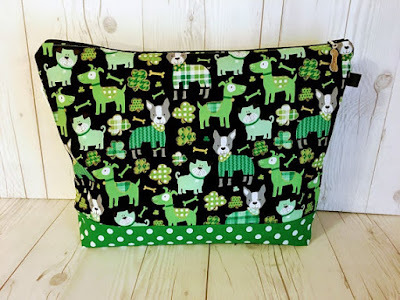 I've shopped at both Blue Dog Workshop and Lavender Hills Knits in the past and been extremely happy with my purchases and the customer service from both of these Etsy shops. 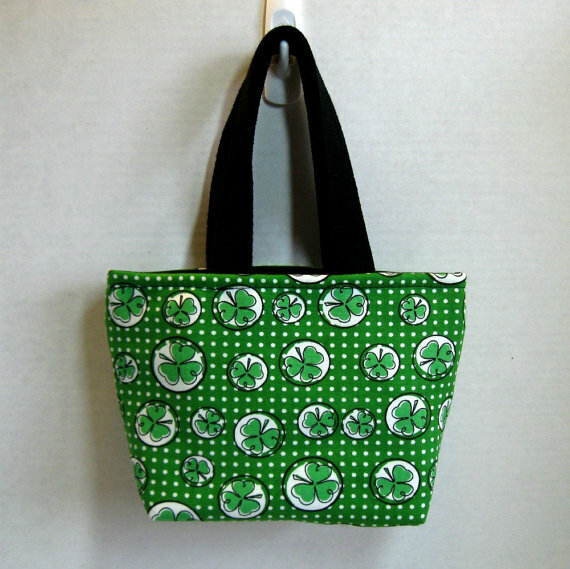 Creative Jen V, is offering this adorable shamrock mini purse. Last summer I purchased a non-holiday bag the same size from Creative Jen V & couldn't be happier with it. It's the perfect bag for socks or mittens and I can't believe the bag's durability. I have abused mine rather badly, and frequently, and it still looks brand new. Or perhaps you'd like a slightly bigger bag. How could anyone resist these adorable puppies all dressed up for St. Patrick's Day? St. Patrick's Day or not, this bag from Quilt Knit Craft is going on my wish list. This larger bag from Shop House of Knot is another being added to my wish list. 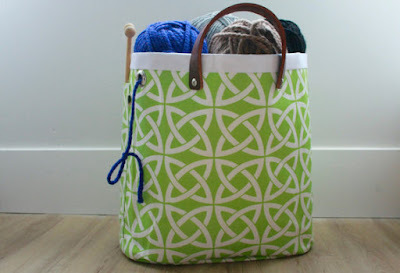 I just love the shorter handles and lime green celtic knots. There were/are plenty of Scots in Northern Ireland, who then immigrated to Virginia and other places southern US, so your combination seems justified for your heritage. (Don't forget to celebrate St Andrew's Day on 30 November this year! And if you are Welsh, St David's Day is on 1 March.) 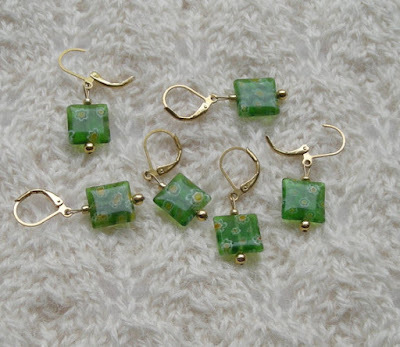 :-) And those millefiori beads, they are very cool - the "flowers" are actually tiny little glass rods embedded in the green glass. The whole thing is then sliced up into beads. Popular in the Victorian Era, I think it is very pretty. I have a diary from a Scottish ancestor. When he was 12 or so, his mom shipped him to Ireland to learn the linen trade. He married & came to America (Jamestown area) to set up shop but was bothered by the "troubles" with the British. They went back to Ireland until the war was over then came back. That was Mom's first US relative.